The one who has made some bad decisions (don’t we all). The one who’s heart aches. The one who I try to support but find it so hard to. I don’t know her story. I don’t know her pain. I don’t know her story. Her struggles. Her sadness. Her brokenness. One of the hardest aspects of foster care is dealing with the birth family. Specifically connecting with the birth mom. From my experience, I believe the more you can support a mother to get her child back, the more positive your fostering experience will be. I know sometimes it’s hard and sometimes you plain don’t want to. You want to protect that child and never let them go back to that environment. Some cases this will remain true. Parents simply cannot provide a safe home, nor do they even try. In those cases, I agree 100% when the judge deems the child a ward of the state, or province and the child becomes ready for adoption by a loving family who will treat them the way they deserve. To be cherished. To be a part of a family. In most cases, it is about the wrong choices and mistakes made. These moms love their children and want them back home with them. I see what has been done. The outcome of mental health, addictions, lack of support. I cry for the child. I cry for the mom. A mother’s love is all-consuming. Addiction is all-consuming. Mental health is all-consuming. Low self-esteem, poor confidence, no one to love them. The result? Wrong Choices. Unsafe choices. Selfish choices. Adoption is beautiful, but adoption is born from tragedy. Yes God calls us to care for orphans, but He calls us to love others first. Even when its hard, even when you don’t want to. I cry because my sinful heart sometimes prays for my needs. My desires to love a child in need forever. My heart should be praying for change, for redemption. To show Christ’s love amidst the brokenness. To be that person for someone. The shining light. So I am sorry birth mom for all the times I judged you. When I thought of you unkindly. When I didn’t look past the circumstances laid in front of me. I will fight for your child, but I will fight for you too. I will put my feelings aside to help put the pieces of your heart back together. I am here to walk alongside you. Even when it’s tough, even when I don’t want to. “The thing is we share something so emotionally intimate. We love the same child. The same child calls us both mommy. There is no other bond quite like that”. I look at your picture and I cry. I see your tears when I pick your child up and bring them back to my home. I see every missed smile, step, giggle, and booboo. All those moments that I get to see, but you have to miss. I see your hurt, I see your pain. I pray that you take that hurt and paint and you turn it into a fight. A fierce fight of love and overcoming. If you fall I will be there for your child. I am thankful God has given me stability, and a heart to help. But I will be your cheerleader. I will try to help you. As much as I don’t understand your choices, I still love you. Because our child loves you. Because God loves us all. Forgiveness is given, and second chances are always deserved. I hope you can look at birth moms of foster children in a new light. Support them, get to know them, love them. I know how hard it can, but I know how special it can be too. As long as it is safe to do so, meet her as soon as you can. She will see you are not a bad person and you love her child. It helps to ease her mind and fears knowing who her child is with all the time. 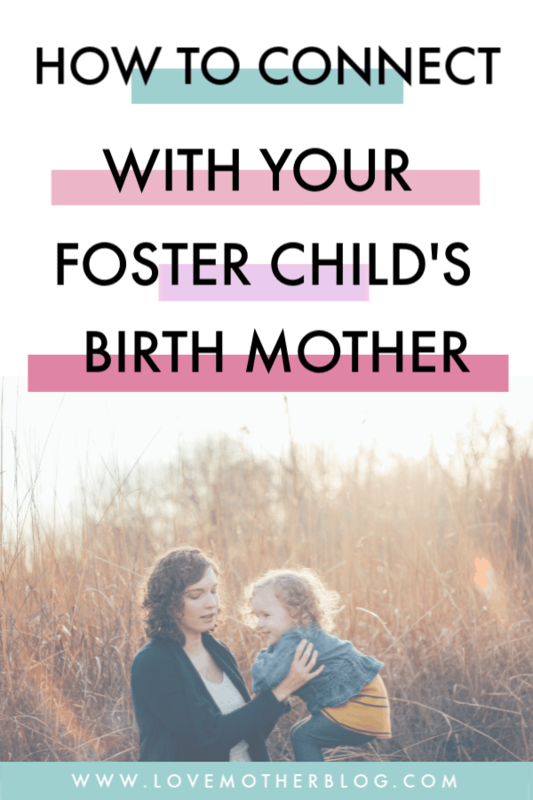 It can be chit chat, it can be focused completely on the child, or it can be to let her know you are here for her, and that you want to see her child back with her. Give her a way to contact you. We have an email set up strictly for communication with birth families. After I feel them out I usually give my phone number as well. When we had our boys for 6 months we would call their mom every night so they could chat for a few minutes before bed, and she would do a count down to sleep, read a book over the phone as we paged through, and eventually, they video chatted with her every night. I took slow steps, but as I learned I could trust her, and she was respectful of the time on the phone, I would give her more contact. Most of the birth moms I have gotten to know, do not drive. They rely on public transportation or walking to get to their visits. Even in the middle of a snowstorm. Offer a ride home after a visit. Ask them if they want to come to the next Dr appointment and offer to pick them up. Send lots of photos, and videos. Again through the email or phone number you give. They miss their kids, they are often in very dark places, and a simple sweet picture of their child can mean a huge change in their day. A quick video with their child telling them they love them will mean the world to them. Offer extra visits on special occasions. Keep a bin where you add any special momentos, or crafts. I often jot down little milestones or special moments with the date on a piece of paper and add those in there too. I send the file of momentos with the child when they return to mom. Make a photo journal or written journal/baby book. They want to know when baby smiled for the first time, or took their first steps. Document their time with you as much as possible. Birth Moms appreciate this so much. I like a journal with a place for a pen for the ease of back and forth. Here is a cute baby book I have purchased in the past, and this beautiful, simple design baby book. I also LOVE this book for kids in foster care for when they are reunifying or moving to a kin placement. It is a simple story with just enough space for memories and a few photos. Especially if you are not a huge scrapbooker. This makes it easy. The author Jamie has done an incredible job and our last foster daughters whole family cried when they read the book we sent home with her after reunification. any clothing, toys, or special gifts they give the kids. If Tommy comes home with a big stain on a special shirt she bought, or a toy gets broken that was passed down, it can really hurt her feelings. Obviously, stuff happens with kids, but just try to take extra care of special belongings. This also means a lot to kids as well. Do not over give advice, or tell her how to do something unless asked. That is the social worker’s job, you need to remain neutral. By all means, if you are asked: “how does she like to be put to sleep?” Then go ahead and tell her how you do it, but you have to allow birth mom to figure it for herself out too. Do not get upset if birth mom makes a suggestion, or says something should be done differently. Take it all with a grain of salt. The kids are in your care, and not hers for a reason. I want to use birth moms of little ones who don’t talk yet as an example. As this is where I have seen this behaviour the most. Or they might tell you she only likes being rocked to sleep in her car seat, when in your home the only way she likes to go to sleep is in your arms. Often time these moms are very inexperienced and can be overwhelmed or anxious and the babies sense that and will often fuss or cry a lot. Mom thinks it means hunger when you know the baby is just not comfortable with how she is being handled. Another example is they might criticize the fact that you use generic diapers and not Pampers brand, and tell you that baby is allergic (when you know she isn’t) to the “cheap, toxic ingredients in generic brand diapers”. Just remember they are trying to assert control when they have literally no control over their child. Take everything in stride, and don’t let it upset you. It can lead to resentment. I hope you find these tips helpful in creating a relationship with birth mom. I am always nervous the first time I meet her. I never know what she might be like, I only know the child’s state and the reasons they came into care. Just try to put on your glasses of grace and support her in any way you can! These tips can make all the difference in the world for this very unique relationship. My biggest advice is to make sure they don’t ever feel like you are trying to prove you are a better mother. Be genuine, give grace, and learn to forgive. Check out the video below for more on this topic. How would you handle the rocking in car seat when its been coming out more and more how unsafe and often life-threatening when a biological parent insists to do that in visits? I would talk to your social worker about that and have them speak to the bio parent about it.